The rain has finally returned to the Pacific Northwest. The smell of smoke in the air has been replaced by the scent of damp earth and I imagine those fighting fires are celebrating. Those of us who prefer cooler, wetter weather are celebrating, too. It is as though we have crossed a line: life before the rain, life after the rain. And that gets me thinking about My Pictures After the Storm by Eric Veillé. More witty than funny, this picture book proves that a picture is worth a thousand words. We have Back to School Night tonight. The picture of me after BTSN will be more about exhaustion than humor. I have a couple of boys who truly laugh out loud when they read. They are young 6th graders. They like funny books and they really get into them. The class will be reading silently, then, suddenly a snort or a chortle erupts. The best part of this is that these boys seem to be oblivious to the effect of their outbursts. They blithely carry on reading. 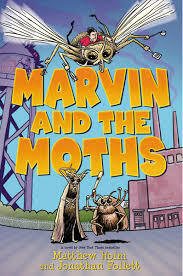 Jonathan Follett and Matthew Holm must have had in mind when they wrote Marvin and the Moths. I can picture them chortling as they read this book, which I won in Goodreads Giveaway. 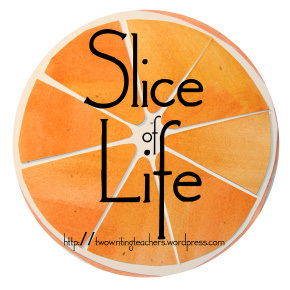 For my part, I found it a little slow to get started and stereotypical, but it will be a welcomed addition to my classroom library. Publisher’s Summary:Matthew Holm, the Eisner Award–winning co-creator of Babymouse, teams with his childhood best friend for a hilarious prose debut. Middle school is off to a rocky start for Marvin Watson. Doomed to misfit status, his only friends are a girl with major orthodontics, the smelliest boy in school, and the trio of sarcastic man-sized moths that live in his attic. No one said middle school would be easy! Also, no one said that Marvin’s town would be threatened by mutant bugs, including a very hungry, Shakespeare-quoting spider. But life in the suburbs is full of surprises. Will Marvin be the one to unravel the mystery behind the mutants and save the town? Or will he be too busy with the real threat: his first school dance?! This hilarious send-up of middle school has the humour of James Patterson’s I Funny, the underdog hero of Diary of a Wimpy Kid, and the zany action of NERDS… and features illustrations by co-author Matthew Holm, New York Times bestselling illustrator of the Babymouse series and Sunny Side Up. 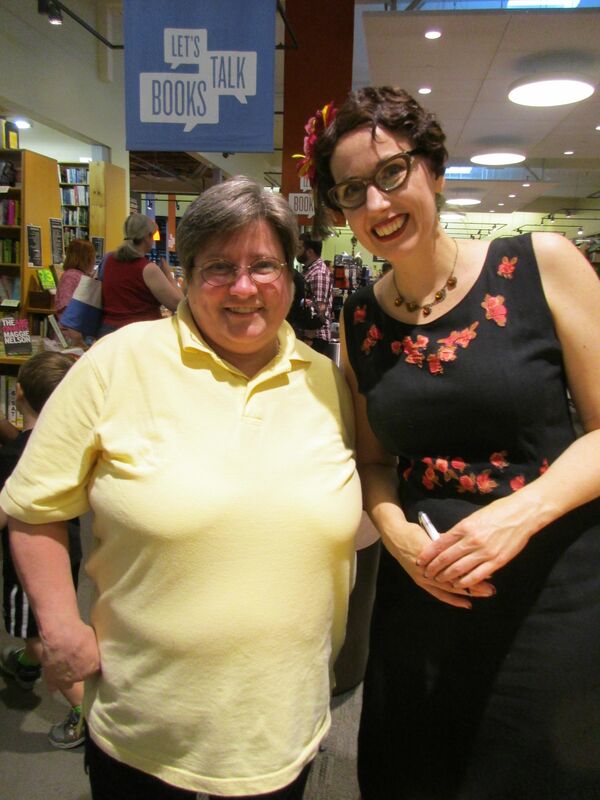 Instead of spending Monday night glued to my radio listening to the speeches at the Democratic Convention, I went to Powells to meet Gail Carriger. She is the author of the Finishing School series I finished in April.She was in town promoting her newest novel, Imprudence, the sequel to Prudence, and the second book in the Custard Protocol series. Unlike many author presentations, Carriger gave a very brief presentation, covering topics she is asked about a lot. She spent most of the time answering questions of the packed house. 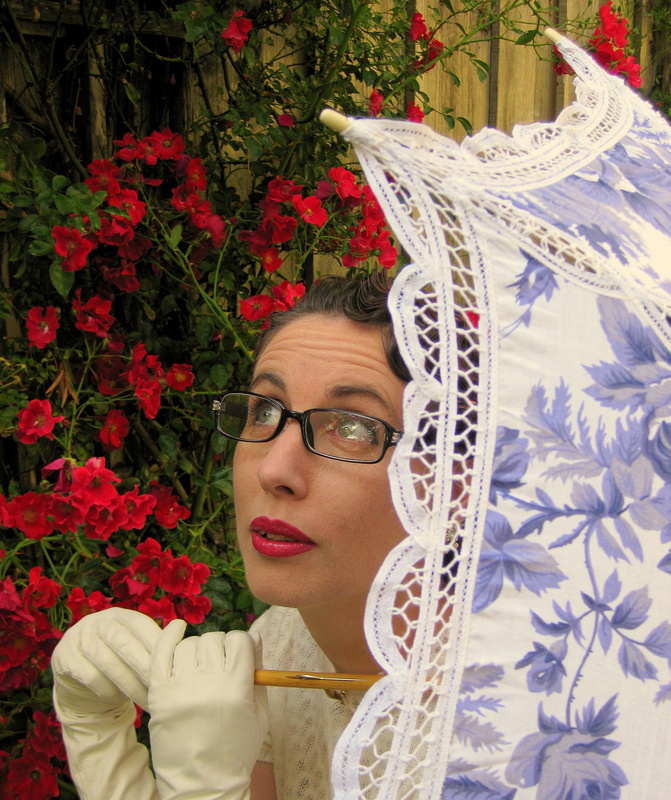 Through the wide range of questions, we got to know Gail Carriger’s sense of humor, writing routine and plans for the future. I’ve been reading her series out-of-order. 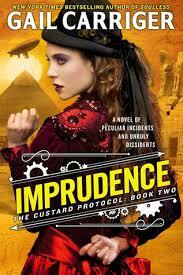 I started with the Finishing School series, the began The Custard Protocol. 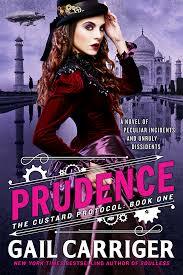 Now, I have her first series, The Parasol Protectorate, in my queue. Each of these series is unique unto itself, but they are all set in the Steampunk world she created and there are some characters that overlap. I loved how Carriger explained that each of these repeating characters seem to be a little different in each series because are shown as perceived by protagonist of the series. I was impressed and that helped explain why the Lord Akeldama of Prudence is so different from the Lord Akeldama of The Finishing School. Of course, I took my moment to get my books signed and chat for a few moments with Gail. When I got home, I learned I had missed some fabulous DNC speeches, but I didn’t mind. I could watch them online. I had enjoyed a marvelous evening and had a new book to read. After my father’s funeral on Saturday, most people were going back to my eldest sister’s house for a reception. I drove there with my twin sister, her husband and my mother, who wanted to stop at her place on the way home so she could change clothes and drop off the flowers and urn. When we got to her apartment building, we dropped Mom at the front door so we could park, telling her we’d carry everything in. After parking my brother-in-law, Tom, took the flowers, my sister, Andrea, took purses because she had a key to Mom’s building, and I carried the urn. Once in the building, we pushed the button for the elevator and got on as soon as the doors opened. We didn’t realize it was going down until it started. No matter. It was only one floor down. When the elevator doors opened in the basement, a very tall man and a short woman got on. Realizing what we carried, the man avoided eye contact. The woman took it all in with her eyes. You could see her looking at the flowers, reading the words on them: Husband, Father, Grandfather. She looked at me, the bearer of the urn, and said, “Is that him?”. All I could do was nod. It was all over in a moment. The doors opened on the 3rd floor and they stepped out. As soon as the doors closed, we burst into laughter. I’m sure they could hear us as we travelled all the way up to the tenth floor. Yesterday was a hard day, generally, in 4th grade. All 4 teachers seemed to have some spot of trouble to help kids with. On the other hand, there were also lots of funnies in my class this week I have to share a couple. 3. Working on MLK timelines, a kid mispronounced Burmingham as Burningham….not funny haha, but apropos. 4. Today, a pair was having some trouble working together. One of them said “Who even voted D at our table?”. Well, I moved D to work with another student and had a heart to heart with the speaker. I told him I would have cried if I were D. The the speaker said, Well, D only wants to work. She doesn’t ever mess around.”. I replied, “That’s why I put her there.”. 5. Our OBOB (Oregon Battle of the Books) battles started last week. I tell the kids they should always say something. Twice this week, kids made random guesses that were right. the best was to a 3rd grade team who were asked this question about The One & Only Ivan. They had no idea, but took my advice to heart and decided to say 45. Imagine the surprise on their faces when they heard that their answer was correct. We had a good laugh about that. Any funnies in your week? As a twin, I never needed an imaginary friend, but I know lots of people who had one when they were young. My favorite belonged to a roommate I had in Colombia. Her imaginary friend was named Chalk Lipstick. 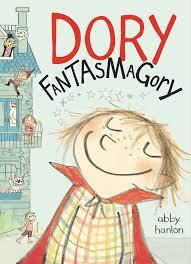 In Dory Fantasmagory by Abby Hanlon, Dory’s older siblings won’t play with her because they say she acts like a baby. She also has endless energy, a vivid imagination and imaginary friends. Since her siblings won’t play with her, she spends a lot of time with her imaginary friends outsmarting the monsters all over the house, escaping from prison (aka time-out), and exacting revenge on her sister’s favorite doll. Her imagination actually helps solve the problem with her older siblings. When Dory (aka Rascal) becomes a dog she’s invisible to the little-girl–stealer but appealing to her older brother, who, it turns out, always wanted to have a dog. Unfortunately, with this success, Dory refuses to turn back into a little girl, which turns her siblings against her again. In a final act of bravery,however, Dory proves that she is no longer a baby. This is a great book for kids ready to move on to chapter books. Dory is six and has a very strong and compelling voice. Child-like drawings with hand-lettered speech bubbles add to the true to life humor of this book. 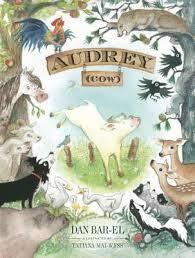 This would be a great read aloud or early venture into chapter books.